Comparing Earth formation with the other planets. Students use the internet to investigate the formation of the planets. The nebula condensed and became a spinning disk. These pictures show real spinning disks in the Milky Way galaxy. the pictures were taken by the Hubble Space Telescope. 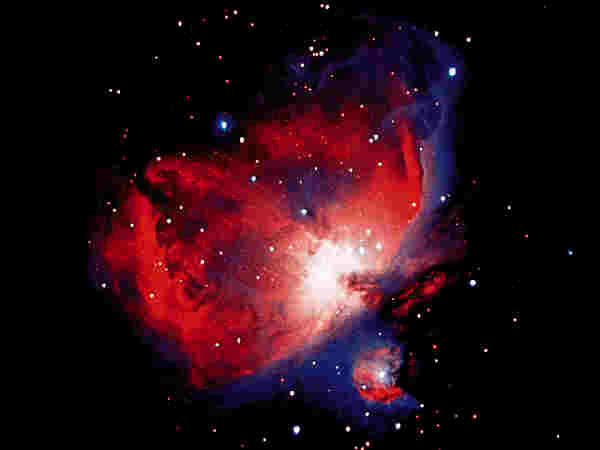 The most widely accepted model for the origin of the Solar System is called the nebula theory. Most generally phrased, the theory states that the Solar System condensed from a large, lumpy cloud of cold gas and dust. This idea was first in the late 18th century by two Europeans, Immanuel Kant and Pierre Laplace. Extensive observations since then have confirmed that the nebula theory is the best explanation for the origin of the Solar System. All theories are subject to refinement as new data is gathered. According to the nebula hypothesis, the Solar System began as a nebula, an area in the Milky Way Galaxy that was a swirling concentration of cold gas and dust. Due to some perturbation, possibly from a nearby supernova, this cloud of gas and dust began to condense, or pull together under the force of its own gravity. Condensation was slow at first, but increased in speed as more material was drawn toward the center of the nebula. This made gravity stronger, making condensation faster. The Sun formed from material that condensed in the center of the spinning disk. The nebula also began to spin counterclockwise, as it conserved the angular momentum of the material drawn toward the center. This spinning made the material around the center of the condensing nebula flatten out into a disk-like shape. Nebulas, at this stage, have at its center. A roughly, spherical core, surrounded by a disk. This has been observed by the Hubble Space Telescope. The remainder of the nebula theory is based more on modeling and indirect evidence. The center of the nebula continued to contract due to gravity. Eventually, pressure and temperatures in this mass became high enough that nuclear fusion started. The central mass became a star, the Sun. While this was happening, condensation was also occurring in the disk. 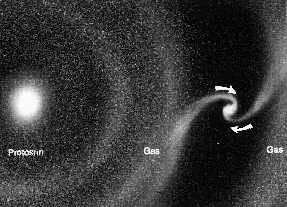 Gas and dust came together to make tiny particles, which gradually joined with other particles, making larger and larger objects. These objects grew to be several hundred kilometers in diameter; they became protoplanets. The protoplanets had much stronger gravity than the very small particles of gas and dust around them. They began to behave almost like vacuum cleaners, attracting the small particles around them. Protoplanets also collided from time to time. These collisions, plus the "vacuuming" of small particles, formed the planets of the Solar System. Gravity pulled these bodies into their current spherical shapes. The protoplanets were not just sitting still in space while condensation occurred. As they formed, the disk of the nebula was whirling around the core, as described above. The protoplanets continued this motion by revolving around the newly evolved Sun. In addition, the protoplanets, and the planets, as they formed, began to rotate, or spin on an internal axis. This took place as some of the force from collisions was converted into rotational energy. The large moons of the gas giant planets (Jupiter, Saturn, Uranus, and Neptune) formed in a similar fashion to the planets. The small moons of the gas giants, as well as the moons of Mars and Pluto are probably leftover debris from formation of the planets that were captured by their respective planets’ gravity. They are captured moons. The Earth’s Moon probably formed a third way, from a collision between the Earth and a large protoplanet. The Solar System has continued to evolve since its formation. It is likely that the orbits of the planets were originally more oval-shaped, and have changed to their current nearly circular shapes with time. The number of moons around some planets has increased through gravitational capture and collisions. 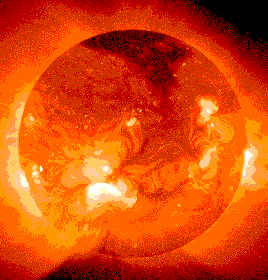 The strength of the Sun (the amount of solar radiation emitted) has also likely changed. It is important for students to realize that the Solar System is a dynamic place. In addition, each of the planets has evolved as well. The Earth is a good example of this. The evolution of life has radically changed the composition of the Earth’s atmosphere and oceans. It has also greatly modified how rocks are weathered and eroded, and how elements cycle through the hydrosphere and lithosphere. Each of the other planets has its own story of evolution. We are just beginning to understand these. Discussing how the Solar System formed may cause a small stir in your class if religion somehow enters into your discussion. If this happens, it is important to emphasize that the nebula hypothesis is based on scientific evidence, and is our best explanation of how the Solar System formed. However, for religious students, it may help to explain that science does not necessarily explain why the Solar System formed. For some people, this is a matter of belief. What students think and feel about this depends on their backgrounds and what their parents want to teach them. Students will make up their own minds when they mature. Presenting this material as scientific evidence will help them to form their own conclusions. Remember, many scientists have religious beliefs and do not see any conflict. Describe the formation of the Solar System to the students. Show them the pictures of a nebula, flattened planetary disk, and the Sun. The key point is that we do not really know how our Solar System was formed, although most evidence points to the nebula theory. 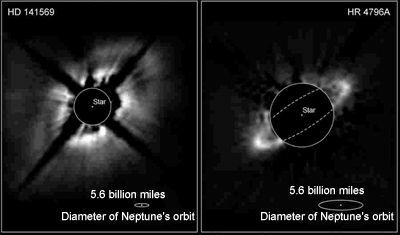 Below is a shorten story of two different ways the Solar System could have formed. Remember don’t confuse Universe Formation with Solar System Formation. COLD WORLD. As a possible story goes, a nebula collapses under gravity. Particles come together to form larger particles. Planetesimals form which are pre-planets. The spinning attracts more particles until the size grows. The energy released during this collapse is converted into motion. The motion becomes two dominant forms, rotation and revolution. The objects that revolve tend to have a gravitational attraction to the larger mass. When the energy of the original collapse is converted, it creates a planetary system with a Sun and planets. Sounds simple enough, but all the evidence is not in, and this may change. HOT WORLD. The other major line of thought was first proposed by Count Buffon in 1749, where two stars "bumped" in the night. This Collision Hypothesis requires that the Earth was "hot" when it formed. However, evidence from understanding how the Earth has evolved over the last 4.5 billion years suggests that the Earth had a cool beginning and has later heated up through processes of radioactivity, friction, and gravity.